Familiarise yourself with Bay Dental and our practice before for your visit. Upon arrival at our office, you will meet our team and begin the diagnostic process. Our staff can assist you in the completion of a new patient questionnaire as well as medical and dental history forms. We strongly believe that comprehensive dental care starts with a thorough initial examination visit. This may include necessary diagnostic treatment which can include radiographs (x-rays), impressions of your mouth, photos of your teeth and smile, and finally and most importantly, an in-depth discussion of your dental concerns, requests and specific needs. Patients wishing sedation will require a pre-treatment consultation, to assess suitability for sedation and be informed of treatment requirements. Occasionally, treatment can be performed on the same day as the initial examination and consultation. However, complex treatment planning will necessitate a second visit to allow us to review, organise and develop a comprehensive treatment plan for you. New patients are always welcomed! Bay Dental is open Monday through Friday from 8 a.m. until 5 p.m. with expanded hours on alternate Saturdays 8am until 1pm for the convenience of our busy patients. 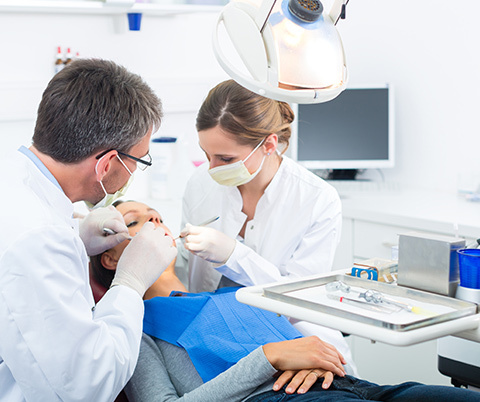 We will always schedule your appointment as promptly as possible and if you call with a dental emergency, every attempt will be made to see you that day. Advanced scheduling techniques allow us to see each patient as scheduled and minimise wait time. Our entire dental team is very sensitive to our patients’ busy schedules and we pride ourselves in accommodating you whenever possible. Your appointments, like your dental treatment, will be tailored to your specific needs. We will do our best to work around your schedule and expedite your treatment when possible. Your referral slip and any x-rays you may possess. If you have dental insurance, bring the necessary card(s) and information. This will save time and allow us to help you process any claims via HICAPS.